We offer an unbeatable location, just one minute walking from the Cathedral and Alcazar; the most modern and confortable beds in the city with curtains, a personal led light and a plug; the most amazing and friendly staff who organize different activites every day. We want you to make new friends and become Seville your favorite city in Europe! Our concept is clear, we are a social hostel with amazing people, activities and the best atmosphere to make your visit to Seville unique. Hostel One Catedral is located in the heart of Santa Cruz neighborhood, known as the Jewish quarter, just one minute walking from the Cathedral, the Giralda tower and the Alcazar. 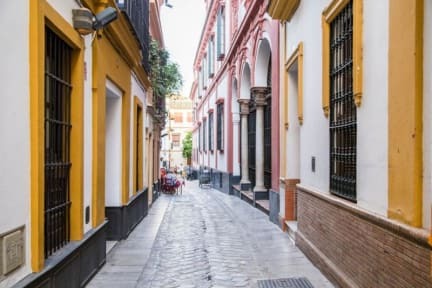 Surrounded by many restaurants and tapas bars, our house is the perfect place for you to start exploring the famous labyrinth streets of the most beautiful and interesting area of Seville. Payment upon arrival by cash, credit cards, debit cards. This property may pre-autorised your card before arrival. Receptions hours from 08.00 am to 12:00 am. If you want to check in between Midnight and 8:00 AM, please let us know in advance. È stata una bellissima esperienza, la posizione è ottima per visitare la città, a livello di pulizia è il migliore ostello in cui io sia stato e lo staff è eccezionale tutto molto simpatici e disponibili.. Un posto che consiglio vivamente! One Hostel is a young and dynamic reality in the center of Seville. Everything was perfect, from the staff and the cleanliness to the group hangs at night. Super reccomended! Really wonderful place! Best location and best atmosphere that we could desire! I hope to return there soon! ottimo ostello ! letti puliti, materassi confortevoli, bagni puliti ma soprattutto accoglienza al top!!! ringrazio Michele e tutto lo staff per avermi fatto passare una bellissima vacanza! My stay in Seville was perfect thanks to this excellent hostel. The hostel is clean, it is in a central position and it is the perfect place where you can meet many people. The hostel offers free dinner and tours around the city. All this creates a friendly atmosphere, also thanks to the staff, they are open and friendly and super kind. I strongly recommend this hostel! Posizione ottima. Clima stupendo, si vengono a creare (grazie anche ai ragazzi) situazioni in cui è impossibile non fare conoscenze. Offrono colazione (caffè, biscotti e nutella a volontà) e cena (un piatto abbondante): davvero inusuale per un ostello con prezzi medio-bassi. Bello il tour dei pub delle 23:30. Camere ben fornite, bagni piccoli ma puliti. Consigliato vivamente.